Last week, we celebrated ‘Makara Sankaranthi’ or Pongal, the harvest festival of Tamilnadu. It also denotes the end of ‘Maargazhi’ and birth of ‘Thai’, one of the most auspicious months in the Tamil lunar calendar. This day also marks the commencement of Uttarayanam (mid Jan - mid Jul), the northern ascent of the Sun. The days are warmer and longer from now on. Pongal is celebrated for three days as Bhogi, Pongal, and Kaanum Pongal/Maattu Pongal. Bhogi is like spring cleaning. People discard old things and buy new ones. As this festival falls soon after the harvest season, the farmers could afford to stock their homes now. The houses are cleaned, white washed, and decorated with kolam. The family congregates to celebrate together. When there are people, there is always good food, particularly sweets. Poli is the star of the day, accompanied by crunchy lentil fritters (called aama vadai). The second day, Sankaranthi, is celebrated in honor of the Sun God. Pongal is the name of the festival, as well as the sweet that is prepared this day. Heavy bottomed bronze pots are cleaned, seasoned with rice flour on the outside (for easy cleanup), and adorned with ginger and turmeric plants. 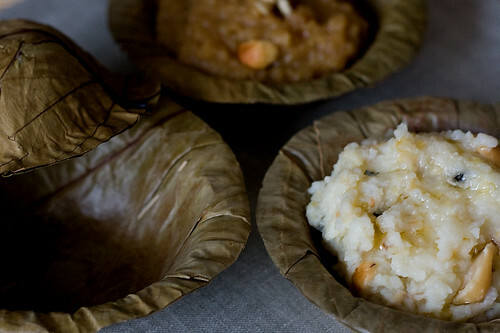 Newly harvested rice, is cooked along with milk and jaggery, and offered to the Sun God. Along with this, an array of vegetables, rasam, sambar and vadai (with no onion) are also prepared. But what attracts the kids most is the sugarcane. They are right in season and are part of the offerings. They are nature’s stick candy, convenient to carry and a pleasure to eat. The bite into the delicious flesh and the rush of the sugarcane juice in the insides of the mouth is an experience everybody should have, at least once in their lifetimes. On the third day, the cows are adorned and worshiped, hence the name maattu pongal (which literally translates to cow pongal). On this day, the sisters also pray for the wellness of their brothers by offering the previous day's pongal to the birds. Also, leftovers from the previous cooking, namely the different vegetables and sambar are cooked in a single pot making Ericha Kozhambu, a hodgepodge that I absolutely love. On this day, the food is fairly simple in my house after all the feasting in the past two days. Curd rice with ericha kozhmabu takes care of all the leftovers. And there is always sugarcane to indulge in. It is so much fun being around the family during festivities like such. It is imperative that I miss being home on occasions like these. But I make a point to celebrate (read as prepare the customary treats), if at all in a simple manner. 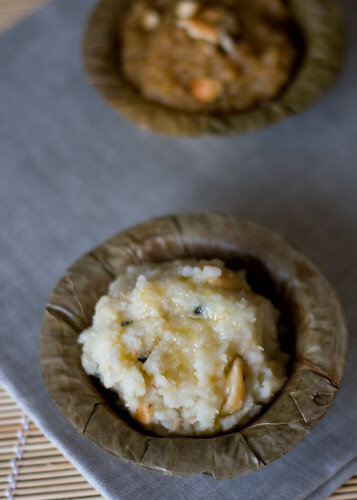 Even during his bachelorhood, G celebrated pongal by making the savory and the sweet version along with gosthu. I have heard tales where his friends used to drive 6 hours to get to eat his killer pongal. I find this more convenient, than preparing rice and vegetables, in addition to sakkarai pongal, for just the two of us. Also, dessert gets to be half the meal. What is there to complain about? Today I am giving you two almost similar recipes for sarkkarai pongal. One, if you are preparing just the sweet kind; the other for making both sweet and savory versions together. They make for an excellent weekend brunch. 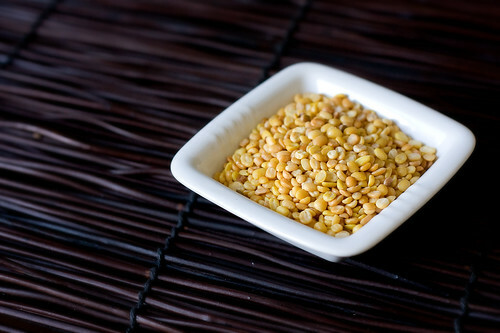 Roast moong dal until light golden brown. Let cool, and wash dal along with rice in two changes of water. If cooking on stove top, combine milk and water with rice and dal in a wide, deep vessel, and cook until mushy. The mixture needs to be stirred now and then, to avoid sticking to the bottom. This traditional method of cooking takes about 25 minutes, but is delicious. 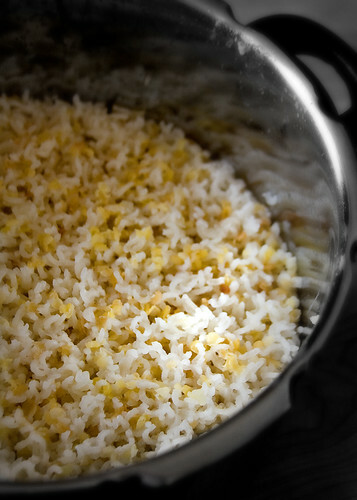 If using a pressure cooker, combine milk and water with rice and dal directly into the cooker and cook for 6 whistles. Open the cooker only after the pressure has died down. When cooked, the mixture should be very soft, that it shouldn’t resist the spatula at all. Meanwhile, dissolve jaggery in ¼ cup of water. Take off the heat and filter the syrup for any impurities. 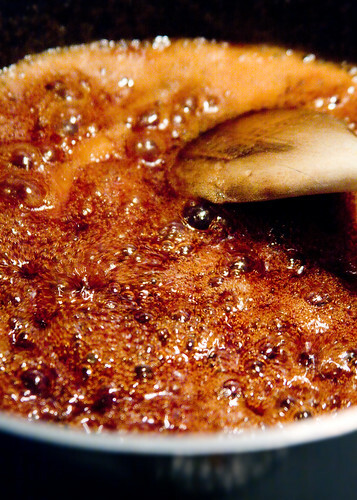 Return the jaggery solution back to the heat, add sugar and allow it come to a brisk boil. After 5 minutes, mix 2/5th (pardon the numbers, it is a little more than 1/3rd) of the cooked rice-dal mixture and combine thoroughly. In a small skillet, heat a tbsp of ghee, roast 10 cashews and raisins, until the nuts are golden and the raisins are plump. Add to the sweet pongal, along with cardamom, and edible camphor. Return the skillet to heat, add another tbsp of ghee, roast the remaining cashews, pepper, cumin, ginger and curry leaves. Add this mixture to the remaining 3/5th rice-dal mixture in the cooker, along with salt. Mix well and serve immediately. If you are making just the sweet pongal for dessert, cook rice-dal mixture with more milk. Also, instead of making the sugar syrup separately, the sweeteners are added directly to the rice. But for that, the recipe remains the same. Roast the dals until lightly golden. Cool, and rinse along with rice. Transfer to the pressure cooker with milk and water, and cook for 6 whistles. Or cook on stovetop as mentioned above. When the pressure has subsided, remove the lid and add jaggery and sugar and mix until everything is combined well. Continue cooking this mixture for about 10 minutes on low flame. If the mixture tightens up too much, add small amounts of boiling water to maintain the consistency. The jaggery should have melted completely and should not smell raw. When good aroma wafts from the pongal, switch off the stove. In another small pan, melt ghee, roast cashews and raisins. Add this to the prepared pongal, along with cardamom and edible camphor. Whether you serve it warm, cold or at room temperature, sarkkarai pongal tastes divine. 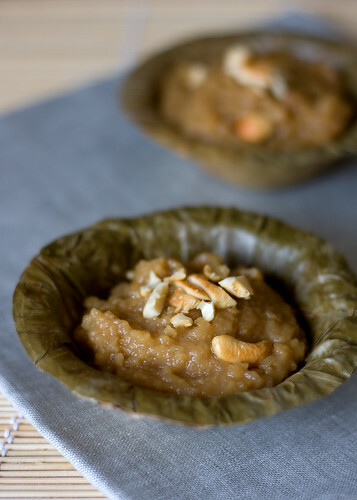 You can enjoy the sweet and savoury pongal with ezhu kari or ericha kozhambu or gosthu to cut though the sweetness. The small amount of sugar added with jaggery is for added umph. Jaggery has a mellow sweetness that appears in the background. Adding small amount of sugar hits the palate immediately. Different brands of jaggery have different levels of sweetness. So the amount given in this recipe is only approximate, and should be adjusted accordingly. You can mix few tsps of sugar in the end, if you desire sweeter pongal. As with any pongal, this should be served immediately. For reheating purposes, sprinkle boiling water to bring back to consistency. While I wrote about ven pongal, I described how it used to be served at temples - in cups made from dried leaves (banana or palm). The taste of hot pongal on dry leaf is beyond description. 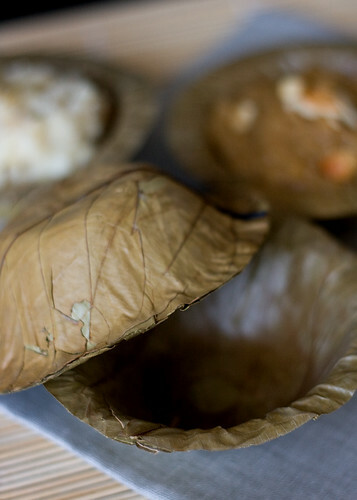 If you had tasted dishes that had been wrapped and steamed in leaves (like tamales or panai olai kozhukattai), you will know what I am talking about. The leaves add an amazing flavor to the dishes which is hard to recreate otherwise. I think this is also one of the reasons that pongal served at temples tastes different than that made at home. I managed to acquire a small stack of thonnai – the non-toxic, bio degradable, sustainable, all-natural leaf-cups from India. I was very thrilled to recreate the magic one more time. I know its late, but my belated Sankaranthi wishes to all of you. You bloggers know it takes more time to write about food than cooking it. Oh dear I am drooling. I had this sarkarai pongal with a curry similar to the ezhukari kuzhambu but gravy like. And venpongal with poosanikkai sambar. Oh its divine! Lovely photos as usual! Wishes to you too! Let me cheer, 'pongalo pongal', may I have a bowl or two please? I could just slurp on the jaggery ;)à the rice pudding loks yumm. I know it is easy to cook and then the photo session and what takes most of the time is the writeup. Nothing is late for a delicious Sakkarai pongal. Belated Pongal wishes to you. Pongal looks more attractive in the little Dhonnai~the small little cups. I am not sure if you call it the same. Where did u get those leaf bowls!! I love the smell of those. Great post! I'd be happy to try both versions of your pongal. I love sakkarai pongal! All ur FAB pics make my mouth water!!!! all pics are great...especially the one with the jagerry syrup boiling..well taken..Happy Pongal to you! It is always such a pleasure to learn of these things. 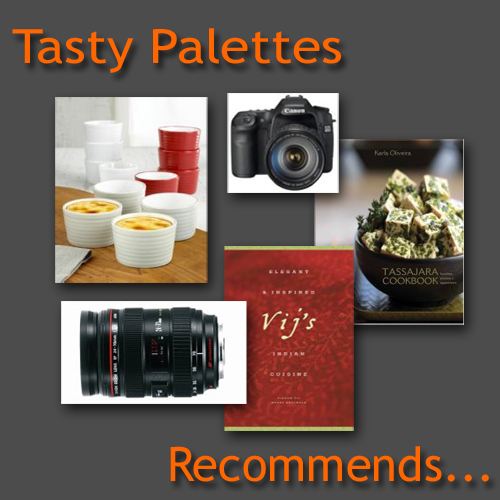 If you're looking beauty matched in both food and place, India's where it's at. I love it! Honestly, anytthing garnised with Cashew nuts is alright with me. drool......pongal is my favorite dish. where to get cups made from dried leaves here in US? Great pic and lovely food! The thonnai add not only traditional magic, but are softly pretty for presentation. Belated Pongal wishes to you and your family. Thank you for the recipe. It made things simpler for me to do. I used your recipe last year too and somehow lost the link and had to search yesterday and finally found it. I hope you dont mind if I pass on the link to few more friends of mine who would like a shortcut to make the two pongals.